What to Do With a Dirty Bird Bath? A dirty bird bath is a hazard in a bird-friendly backyard. Not only is stagnant, contaminated water uninteresting to the birds, but it can also carry diseases that can spread to an entire backyard flock. A dirty bath smells and may attract mice, rats and other unwanted pests. Mosquitoes can also breed in stagnant, unclean water, making a dirty bird bath a hazard even for humans. The smaller the bath and the larger the backyard flock, the faster the water will become contaminated and the more frequently the bath will need cleaning. Fortunately, it is simple to clean a bird bath without scrubbing if you follow the proper steps. This technique will take 20-30 minutes, though for much of the time you'll be able to attend to other tasks as the bath cleans itself. 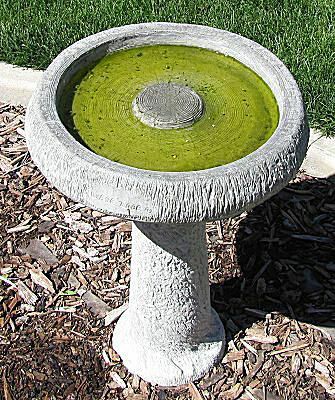 While the basic technique is suitable for bird baths of any material, it is most effective on concrete bird baths or plastic basins. If your bath is unique and delicate, take precautions to protect it before trying this technique. A very dirty bird bath! The first step in cleaning a very dirty bird bath is to get rid of the contaminated water. This water is often filled with organic material such as feces, algae and dirt, and it is safe for watering nearby flowers or plants. Dump the water out in an area where it will be recycled to help the rest of your garden, but treat the basin of your bird bath carefully to avoid damage. If the basin of your bath does not detach, simply tip or tilt the pedestal carefully to drain the water onto nearby plants or grass. To safeguard your birds from this dirty water, avoid dumping the basin near bird feeders or spilled seed that ground-feeding birds may sample. Using the pressure setting on your hose nozzle, rinse the bird bath for 10-15 seconds to remove any stuck on debris, feces or loose dirt. You may not see much change from this rinse, but removing surface material will help the bath be cleaned more thoroughly. If your bird bath has a textured basin, be sure to tilt your hose at different angles to get in every space. If your bird bath has a delicate surface, avoid the highest pressure setting that may loosen a mosaic or chip a surface finish. Instead, use lower pressure or wipe the surface lightly with a soft sponge or rag. Refill the bird bath basin until it is nearly, but not quite, full. It is essential to fill past any obvious dirt or algae lines to ensure that every affected surface will be cleaned, as only areas covered with water will be cleaned. Check that the basin is as level as possible to ensure uniform water levels for even cleaning. If desired, you can leave the basin on the ground to do this, but it will be just as easy if it is on its pedestal. Carefully add a generous cupful of bleach to the water, taking care not to spill the bleach onto nearby plants or grass, and avoiding splashes onto clothing or nearby fabrics. When adding the bleach, pour it slowly around the entire surface of the basin to mix it thoroughly with the water. If desired, use a stick or twig to mix the bleach with the water. The amount of bleach you add can vary, but do not add more than 1.5 cups to a basic bird bath. A very shallow bath will need less bleach, while more bleach may be necessary for a deeper or excessively dirty bird bath. Basic chlorine bleach is most effective, but if you prefer a green-based similar product, you can adjust this cleaning technique for your preferences. Do not use window cleaners, powdered cleansers or other types of chemical products, as they will not be effective. Cover the entire bird bath basin with your black plastic trash bag. This will keep the birds away so they do not drink or bathe in the chemically treated water, and the black color will absorb solar radiation to heat the water and clean the bath more quickly. Pull the bag thoroughly over the basin and down the pedestal so it will not blow away in a breeze. If you are cleaning a ground bath, weight the bag down along the edges to keep it in place. At this point, leave the bath to soak for 10-15 minutes. This is a great time to refill or clean bird feeders, make hummingbird nectar, check a bird house or tend to other tasks in the backyard. If necessary, you can leave the bird bath to soak for far longer, but for thorough cleaning a minimum of 10 minutes is recommended. Very dirty bird baths may need longer soaking to be fully clean. Soaking the bath longer will not be detrimental in any way - the bath will just get cleaner. When you remove the trash bag after letting the bleach water soak, your bird bath will look like new. If there are still remains of algae or scum in the basin, replace the trash bag and let it soak longer. Otherwise, discard the trash bag or save it for reuse – the same bag can be used every time you need to clean your bird bath. It is important not to leave the bird bath untended at this point. The clear water and full basin can quickly attract thirsty birds, but the high chlorine levels in the water can be fatal. Instead, drain the water immediately. Avoid dumping it directly on grass or plants, but feel free to dump it on weeds or in an unused area of your yard. As with your first water dump, avoid draining the chlorine water near bird feeders or spilled seed. After dumping out the bleach water, use the pressure setting on your hose to thoroughly rinse the bath. A rinse cycle of at least 1-2 minutes is recommended to dilute any remaining traces of bleach and make the basin safe for drinking and bathing. As before, tilt the angle of your hose to ensure you get into every nook, cranny and crease of the basin so every part of the surface is thoroughly rinsed, and take care to protect delicate surfaces. If you aren't sure when the basin is properly rinsed, stop and sniff the bath's surface. If it smells strongly of chlorine, more rinsing is necessary. A faint chlorine scent is acceptable, but it should not smell as strongly as a pool would. At this point, too much rinsing is better than too little - err on the side of extra rinsing rather than not enough, or the water may be contaminated. Allow your freshly cleaned bird bath to thoroughly dry in the sun. This will further discourage algae growth and keep the bath fresh for a longer period of time, and it will help sterilize the surface against bacteria or other contaminants. On a hot, sunny day, the basin can dry in just a few minutes, and you can use this time to put away your cleaning materials or finish refilling bird feeders. If you do not have the time to allow the bath to thoroughly dry, it is acceptable to skip this step so long as the basin is thoroughly rinsed. Refill your freshly cleaned bird bath with cool, clear water for the birds to enjoy. Properly filled, a bird bath should have a depth no greater than 1-2 inches so birds can easily drink and bathe. If your basin is too deep, consider adding large, flat stones to give birds a shallower area to use. You can also attach a dripper, mister or bubbler to attract more birds. Voila! Your bird bath is clean and safe for the birds, without using any scrub brushes or elbow grease. With the bleach treatment, the bath will remain clean for several days. You can keep it clean even longer by draining, pressure rinsing and refilling the bath daily before it will need another thorough cleaning. Frozen Bird Bath? Thaw It Out Without Damage! Is Your Bird Bath Actually HURTING Birds? Keep It Safe! Is Your Bird Bath in the Best Place? Don't Put it In a Dangerous Spot! Is a Concrete Bird Bath Best for You?